BELAIT, Sunday, December 7, 2014 - THE roles of the family as a social institution and of the government leaders were among the topics discussed yesterday in a public forum on the monarchy. Co-organised by the Belait District Office and Brunei LNG Sendirian Berhad (BLNG) and held at the Pusat Insani in Seria, the forum was held to mark the 68th birthday celebrations of His Majesty Sultan Haji Hassanal Bolkiah Mu’izzaddin Waddaulah, the Sultan and Yang Di-Pertuan of Brunei Darussalam. The forum titled, “Kekal Beraja Sejahtera Negara” (A Lasting Monarchy for a Prosperous Nation), saw participants use a live conferencing tool for the first time to raise issues anonymously to a panel of local experts on the subject. Moderated by Ali Yusri Abd Ghafor, Acting Head of the Counseling and Career Section at the Department of Schools, selected questions from the audience were posed to the two panelists: Dato Seri Setia Hj Abd Aziz Orang Kaya Maharaja Lela Hj Yussof, Permanent Secretary at the Ministry of Home Affairs (MoHA) and Hj Mohd Rozan Dato Paduka Hj Mohd Yunos, Permanent Secretary (Media and Cabinet) at MoHA. Guest of honour, MoHA Minister Yang Berhormat Pehin Udana Khatib Dato Paduka Seri Setia Ustaz Hj Awang Badaruddin Pengarah Dato Paduka Hj Awang Othman in his opening address stressed the nation’s belief that its prosperity is attributable to the underlying philosophy of Malay Muslim Monarchy (MIB). 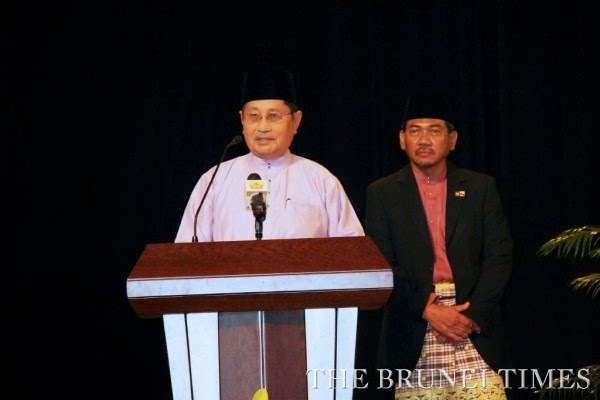 He spoke of the three core objectives outlined in Brunei Darussalam’s Proclamation of Independence, namely the country’s intent to remain as a sovereign MIB nation throughout the ages; the continuous effort for peace and security for its people; and the preservation of good international relations which is free of foreign interference. “These three core objectives reflect the national aspiration that will guide generations upon generations of Bruneians in nationhood,” said the Minister. Responding to a question on the role of families and parenthood, Hj Mohd Rozan urged parents to take a more active role in their children’s upbringing and be more aware of their activities and whereabouts. “The parents’ responsibilities is not merely to feed and clothe their children… they must still hold some control over them,” said the panelist. On government’s role in strengthening values of statehood, Dato Hj Abd Aziz said that only through a collective effort of the government and the people can the country’s long-term vision be achieved. 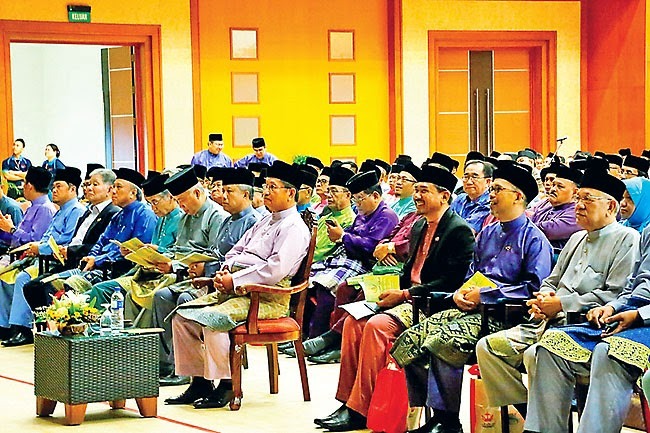 “In Islam, leaders must safeguard the dignity of religion, life, the ability to think, property and the stability of the people… the people are duty-bound to show undivided loyalty to their ruler and are obliged to offer their constructive views and advice to the government,” said Dato Hj Abd Aziz. Also present among the 500 participants were MoHA Deputy Minister Pehin Datu Lailaraja Major General (Retired) Dato Paduka Seri Hj Awg Halbi Hj Mohd Yussof, Belait District Officer Hj Haris Othman, Co-Chairperson of the Forum Working Committee, BLNG’s Legal and Communication Manager Mohd Husini Hj Bakar and BLNG Managing Director Mohamad Hj Damit. THE Belait District Office and Brunei LNG Sdn Bhd (BLNG) held a forum to mark the 68th birthday anniversary of His Majesty the Sultan and Yang Di-Pertuan of Brunei Darussalam at Pusat Insani, Seria, yesterday. The chief guest was Minister of Home Affairs, Pehin Udana Khatib Dato Paduka Seri Setia Ustaz Haji Awang Badaruddin bin Pengarah Dato Paduka Haji Awang Othman. The forum, attended by government officers, teachers, students, private sector and NGOs, discussed the Brunei Vision 2035 and ways to achieve its goals especially in fine-tuning programmes and activities. Among the topics covered were upholding the MIB concept; deepening the understanding on religion in terms of leadership, innovation, entrepreneurship and environmental awareness; instilling changes in thinking and to be proactive in generating changes. 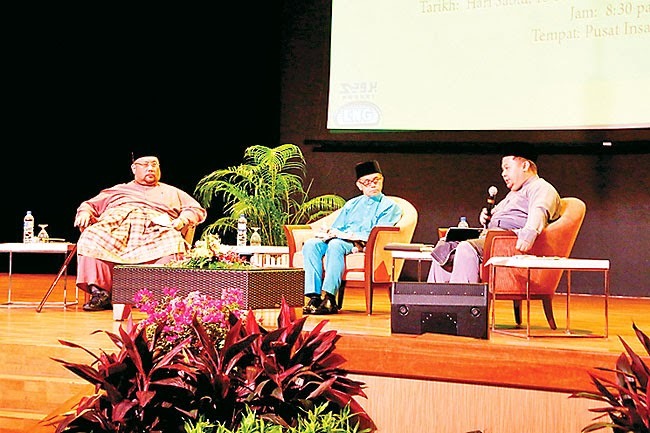 One of the invited panellists was Permanent Secretary at the Ministry of Religious Affairs, Dato Seri Setia Haji Abdul Aziz bin Orang Kaya Maharaja Lela Haji Mohd Yusof. He covered issues such as action plan towards building future leaders and embracing Islamic education. Meanwhile, Permanent Secretary (Media & Cabinet) at the Prime Minister’s Office, Haji Mohd Rozan bin Dato Paduka Haji Mohd Yunos touched upon upholding the national pride that involves unwavering loyalty to the monarch and our leaders. We should also defend the dignity of the people and country by all means to protect the sovereignty and independence of the nation. The forum also explained the roles and responsibilities of the people to the nation under the monarchical system. Brunei Darussalam has attained peace and harmony under the monarchical system. 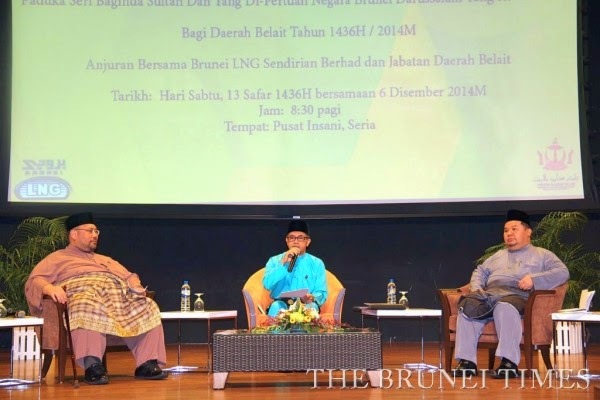 Brunei LNG and the Belait District Office have conducted a series of forums since 2008 to mark the royal birthday.